In the past couple of decades, canola has catapulted from obscurity to celebrity. 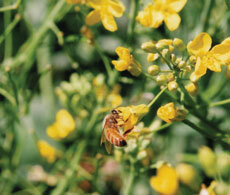 The oilseed made its commercial debut in margarines and cooking oils, edging out more saturated-fat-laden competitors. Now it’s gaining stature as the ideal oil for yet another consumer product: biodiesel. But canola’s rising profile has not come without controversy. A type of rapeseed bred in Canada (hence the name, “Canada” plus “oil”), canola has raised a number of agricultural concerns in Oregon, ranging from “rogue pollen” and “seed scatter” in the Willamette Valley to broader questions about its economic viability for Northwest farmers. The science and economics of canola have the full attention of researchers in OSU’s College of Agricultural Sciences, Agricultural Experiment Station and Extension. “We’re providing research results to officials at the Oregon Department of Agriculture (ODA) to help the agency refine its understanding of the risks and benefits of growing canola,” says Russell Karow, chair of the Department of Crop and Soil Science. Of immediate concern are the risks to the nationally and internationally important and lucrative vegetable and seed-stock businesses in the Willamette Valley. As a species of “brassica” that falls into the same genus as cabbage, broccoli and cauliflower, canola could potentially cross-pollinate or cause harm in other ways to these crops. Genetically modified canola has raised another alarm for growers who export to countries that ban genetically modified organisms (GMOs). To prevent harmful cross-pollination or seed contamination, the ODA has set up canola-free buffer zones in traditional specialty-seed growing areas of the state. But entrepreneurs, eyeing new markets for canola, are pressuring the agency to loosen those restrictions. New canola planting in the valley is on hold, pending data from OSU and further public discussion. The ag college’s research isn’t, however, limited to seed and pollen issues. Lab studies in Corvallis and field trials across the state are investigating a range of other concerns, such as herbicide tolerance, pest and disease management, canola’s value as a cover crop in field rotation and as a feed source for cattle. The findings will help guide decisions about this rising star on the alternative-fuel scene. Not the least of the questions under scrutiny is profitability. Before growers plant canola in place of another crop, they need to know what kind of value they can expect to get. “Converting canola into biodiesel may not be the cheapest option because it may consume valuable land that could be used for other crops,” OSU crop physiologist Brian Duggan told the Bend Bulletin in July. To help gauge canola’s biofuel potential for Central Oregon growers, Duggan is comparing several species for yield and oil quality. At OSU’s agricultural research station in Madras, the researcher stands in a field of two-foot-high stalks topped with butter-yellow flowers. With snowcapped Mt. Jefferson as a scenic backdrop, Duggan gestures outward in several directions, indicating three additional fields, each planted with a different variety. His crop trials, funded by the Agricultural Research Foundation, are designed to reveal whether winter varieties produce more seed — and hence are more lucrative — than spring varieties.